Red Tweak embraces the language of abstraction as deployed in national representations by political actors across the ideological spectrum. 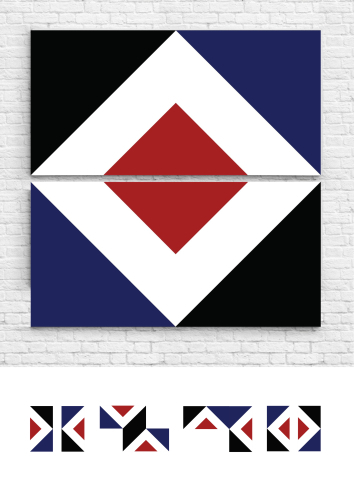 The painting appropriates the New Zealand flag design Red Peak by Aaron Dustin, which won the status “official alternative” in the current referendum by popular demand. While a flag flown at half mast is a well known symbol of mourning, fewer are aware that an inverted flag is used as a distress signal. In contrast, the V shape created may evoke an image of collective victory and optimism. The inverted chevron is also reminiscent of the flag of the North American Vexillological Association. Influenced by the flag paintings of Jasper Johns and Ralph Hotere, Red Tweak shares the dimensions, and in its default position, a formal resemblance to Hotere’s Black Painting (Human Rights) (1964), echoing his foregrounding of Maori, metaphysical and political concerns in the public sphere. Each component shares the 2:1 proportions of both Dustin’s flag and sacred geometry. The diptych may be remixed freely by rearranging the position and orientation of the modular canvas panels. The painting is the first in an unlimited edition: like a flag or symbol, its potential meanings are most valuable when reproduced and circulated.